Chronic pain of varying types including inflammatory pain, cancer pain and neuropathic pain is an increasing health problem for which there are inadequate therapeutic options. Many new targets for analgesic therapeutics have been elucidated, these include TRP channels, the endocannabinoid system, sodium channels and various signaling pathways just to name a few. Many new pharmacological agents which alleviate pain have been identified. In this post, I’d like to introduce some of them which have been recently released by Focus Biomolecules to support pain related research activities. The ultrapotent TRPV1 agonist resiniferatoxin dose-dependently deactivates TRPV1+ fibers and blocks thermal nociceptive responses in baseline or carrageenan-inflamed conditions. Injecting sufficient doses of resiniferatoxin peripherally renders animals unresponsive to thermal stimulation (1). 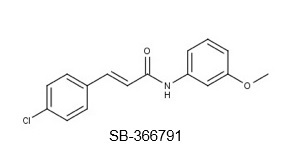 Intracerebral TRPV1 antagonism by SB-366791 significantly reduced chemical and inflammatory spontaneous abdominal nocifensive responses (2). Minocycline can effectively diminish neuropathic pain induced by sciatic nerve chronic constriction injury in animal models (3). The mode of action involves modulation of microglial activation but the precise mechanism is unknown. 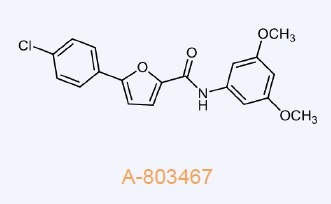 A-803467 is a potent and selective Nav1.8 channel blocker which potently alleviates nociceptive behaviors induced by electrical stimulation in a rat model (4). 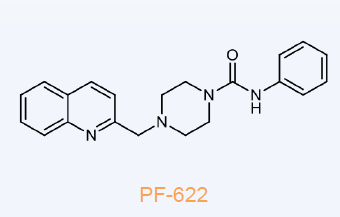 PF-622 is a mechanistically novel fatty acid amide hydrolase (FAAH) inhibitor with remarkable selectivity. FAAH is the enzyme that hydrolyzes and deactivates the endocannabinoid, anandamide. Inhibitors of FAAH produce cannabinoid receptordependent reductions in inflammatory pain and display anxiolytic and antidepressant activity (5).